Even though Paul never personally ministered to the saints in Rome he sent them instruction and encouragement in the form of a letter, which is now the book of Romans in the New Testament. His letter to them was written towards the end of his time in Corinth ( Acts 20:3), Paul hoped that after his visit to Jerusalem he would then be able to visit Rome. At the conclusion of his letter (Romans 16) he gave a long list of greetings to friends and fellow saints who were then living or ministering in Rome. Romans 16 is unique because it gives us an intimate glimpse into the members of the early Christian church, it is also unique because 10 of the 29 people mentioned by Paul in his letter are women-- including his letter carrier Phebe. It appears by Paul's introduction of her that Phebe was unknown to the Roman saints and that her main purpose in traveling from Corinth to Rome was to join with the saints there and complete the "business" she had in Rome. Paul may have chosen her as his letter carrier because she was already planning on the trip, though it is possible that she may have gone for the main purpose of delivering Paul's letter and message to the Roman saints. "The word is used elsewhere in the New Testament to refer to the office of deacon, an office that many Christian traditions have barred women from for centuries... Those who resist seeing Phoebe as a deacon usually point out that the literal translation for διάκονος was “servant,” and Paul uses the term to mean “servant” in numerous places (Rom.13:4, 15:8; 1 Cor. 3:5). However, nowhere else in the New Testament does Paul (or any other author) connect one's status as a διάκονος to service with a specific local congregation, as is the case with Phoebe and the church at Cenchreae. The phrase “διάκονον τῆς ἐκκλησίας” (diakonon tes ekklesias – of the church) is unique to Romans 16:1. Because Paul is listing Phoebe's credentials to Roman Christians who would be unfamiliar with her, because she is probably on official church business on his behalf in delivering his letter, because he connects her διάκονος-ship with a specific local congregation, and because his designation of her as a προστάτις indicates that she was a woman who advocated for and supported others in the Gospel, the textual argument for reading διάκονος as a specific office or leadership position becomes very strong." As I studied Phoebe I was amazed by the amount of debate there is among scholars and theologians over who she was and what type of authority she held in the early church. It is obvious from the words Paul used to describe her-- mainly the word "diakonos" (meaning servant or deacon) and "prostatis" (meaning a woman set over others)-- that Phebe held some type of leadership and authority position in the early Christian church. Just exactly what that position was has become the center of a heated debate as to whether or not women were ordained to the priesthood in the early Christian church and whether they should (or could) be now. From an LDS perspective the words "diakonos" (servant or deacon) and "prostatis" (a woman set over others) present no theological problem. The idea of a woman disciple being set apart and having authority to preside and minister to a specific congregation or to the church as a whole fits right into what Latter-day Saints believe is the responsibility of women in the church. In ancient times Christ invited women not only to be his disciples, but to be actively engaged in the work of saving souls. 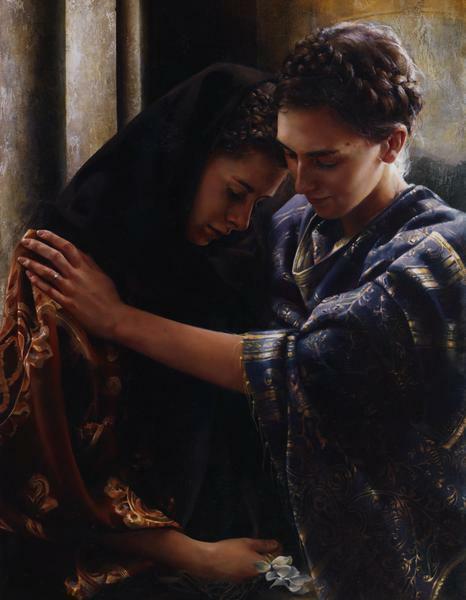 We don't know all the details about how this ancient sisterhood functioned, but since the rest of the LDS church has been patterned after the ancient church we can also we can guess that the basic framework of our modern day Relief Society is the same as it was 2,000 years ago. For example, in the modern Relief Society women from each ward (congregation) are called and set apart by a laying on of hands to preside over and receive revelation about the families within her ward. In addition, within in a Stake ( a group of wards) a Relief Society president is also called who presides over all the Relief Society presidents within that stake. There is also a General Relief Society President who presides over all the Stake and Ward Relief Societies within the Church. These women not only lead and receive revelation about the women and families in their stewardship, but they also work in concert with male leaders to make sure the needs of their members are met. So, as I studied the story of Phebe I saw woman who was fulfilling her "Relief Society" duties in the ancient church. I feel that understanding the meaning of the word "prostatis" (translated as "succorer") lends beautiful depth and insight into who Phebe was and what her contributions were to the early church. As I mentioned above the word "prostatis" means " a woman set over others; a female guardian, protectress, patroness, caring for the affairs of others and aiding them with her resources." "..for she hath been a woman set [apart] over many, and of myself also"
"...for she hath been a female patroness caring for the affairs of others and aiding many, and of myself also." Paul's use of the word "hath" here is also particularly insightful because it indicates that she had been a "succourer" or a "prostatis" for others and for him, but that now she was not. This too fits in with LDS belief and practices, because in the LDS church members are called and "set apart" for a certain office or task. With this setting apart comes a blessing and an infusion of authority to lead and receive revelation specific to their office. Members usually serve in a position for several years, after which they are "released" and the office and authority are then transfered to someone else. That word, regardless of how we use it today, described someone who had authority from the church to administer spiritual and physical relief to the poor. To me that description beautifully fits the calling of the Relief Society. "I commend unto you Phebe our sister, which is one who, by virtue of the office assigned to [her] by the church, cares for the poor and has charge of and distributes the money collected for their use which is in Cenchrea." When it is read this way it is easy for me to see how the word "deacon" or "deaconess" could apply to Phebe. She was one who had been set apart, given authority to preside, and to administer to the needs of the poor. Perhaps the confusion is because the way in which we now use the word "deacon" may not have been the way the word was used anciently. For example take the word "ordination". In the Doctrine and Covenants there are scriptures in which both men and women are "ordained" to offices within the church. For example men were "ordained" as bishops and high councilors (D&C 20:67) and women were "ordained" to preside over the Relief Society (D&C 25:7). In both instances these "ordinations" would be what is now considered a "setting apart" in our modern church vernacular. In the 1828 version of the Webster's Dictionary the word "ordained" is defined as "to set apart", and so for early Latter-day saints the meaning was probably clear. Yet, in recent decades the word "ordain" has come to be associated with priesthood ordination and so the language we use has changed to make the difference clear. Today a person can only be ordained to a priesthood office, like an elder, a deacon, an apostle, etc. While they are set apart to a certain calling like, a bishop, a stake president, Relief Society president, member of the First Presidency, President of the Quorum of the Twelve Apostles, a temple president, etc.. So using the word "deacon" or "deaconess" to describe Phebe's role in the church doesn't necessarily indicate that she had been ordained with priesthood authority. Yet as an ancient member (and perhaps leader) of the Relief Society she would have been organized, as the Prophet Joseph Smith said, "after the pattern of the priesthood" and her work would have been a priesthood purpose. Personally, I love think of Phebe as being called a "deaconess". To me it is a reminder that the work she was doing, the work of Relief Society, is part of the great priesthood mission of the earth. Phebe's story is just more evidence that, from the very start, women have played an important role in God's church and that we are every bit as involved in God's great work of bringing " to pass the immortality and eternal life of man" (Moses 1:39). What does Paul's use of the words "diakonos" (servant, minister or deacon) and "prostatis" ( a woman set above others) to describe Phebe tell you about the role of women in the early Christian church? How does this better help you understand the purpose of the Relief Society in the modern church and the way in which women should work with men in ministering to the church? Why would Paul have sent Phebe to Rome and entrusted his letter with her? What business do you think she could she have had to do among the Saints in Rome? How could you use Phebe's story as a way to help young women and young men better understand the way in which God would like men and women to work together in the Gospel? How does the story of "the elect lady" mentioned in 2 John shed light on the story of Phebe and give insight into how women were organized in the ancient church? Brigham Young once described Eliza R. Snow, the second president of the Relief Society, as " a Priestess, Prophetess, and Presidentess." Why do you think we don't use those words more commonly in our modern day vernacular, what benefits or downsides do you see to using those words to describe Relief Society sisters today? You did such a great job explaining the original Greek words used in the scriptures to describe Phebe. I love learning the history of words and their original meaning as it adds so much to my study and understanding. Timely. Too often we interpret the past through a present lens but use the wrong one. Thank you for this. If we really believe that Joseph Smith was led by God, we believe in the way he restored our doctrines, covenants, and organization. This is an important part of the conversation on women and God. Thanks Heather!! I really enjoyed the article. I just have one thought for clarity's sake. A stake RS President doesn't preside over the RS Presidents in the stake. Each ward RS Pres. is accountable to and presided over by her Bishop. He is the one who gives her counsel and guidance and instruction. A stake RS Pres is there for helping ward RS presidents to learn their respective duties, to instruct, and help in their administrations and questions, but ward RS presidents report to and are under the direction of their Bishop. They are to assist and provide temporal and spiritual support specifically to the sisters of their ward and usually by doing so will bless and assist families. The stake RS Pres. is under the stewardship of the Stake President and follows his direction and counsel in helping the ward RS Presidents. Hopefully the stake pres. is giving the same instruction/counsel to his bishops so that the RS and the priesthood are working in concert. But it is significant to delineate that each RS president, general, stake, or ward, is not presiding, but is working under the direction of her direct priesthood leader. Carin, I appreciate your clarification. It is important to remember that each RS president works with a bishop or a stake president or a prophet. The RS couldn't function without the priesthood and the priesthood couldn't function without the RS. "The formation of a presidency is also a priesthood pattern. Every ward elders quorum president and Relief Society president presides over and directs the activities of the elders quorum or Relief Society in the ward. Quorum and Relief Society leaders have a measure of divine authority given to them regarding the government and instruction of those they are called to lead.16 They are men and women who are “called of God, by prophecy, and by the laying on of hands.” To preside means to stand guard, to superintend, and to lead.18 This means that Relief Society and quorum leaders in a ward carry the responsibility to supervise, oversee, and regulate the work of the Relief Society and the quorums on behalf of the bishop." Preside does not mean that you have to have priesthood keys. A woman can preside (watch over, lead) over her stewardship. For example, even though a husband may preside in the family if he dies or is absent then the mother is the one who presides -- even if there is another male in her family who holds the priesthood. She doesn't have to have keys or the priesthood to preside over her stewardship. When Joseph Smith created the RS he "Turned the key" to the RS, giving it priesthood authority and responsibility. This doesn't mean that it is separate from the rest of the priesthood organization of the church but it does mean that the women who lead it are able to preside over it, just like an elder's quorum president can in his quorum. I think a RS is missing some of the real power of her calling if she doesn't realize that she has been called to preside over her stewardship. I LOVE that talk and think it/she is amazing! OK....maybe my word choice was poor....I do agree that she does preside over her stewardship, but the stake RS President has no authority to direct (this would be the keys, etc...) how work is happening in the ward. She should be a liaison and there to give instruction and counsel, but she is not directly over the other RS Presidents, that is what I am trying to say. Does that make sense? The only reason it is significant is because (I am sure this isn't a problem where the church is stronger) sometimes, here, organization presidents feel that they do not have to follow the instructions of their immediate priesthood leader because instead they are taking directions and counsel from a stake organization leader and feeling that the stake organization leader should give counsel and direction to the Bishop regarding the functioning of the ward. It is a fine line, and probably one that doesn't even need too much discussion, except that it is a problem where I reside and can easily be an area where individuals can get off course if they are not reading the handbooks and listening to the direction of the general authorities (also a struggle here), and seeking the Spirit in their decisions. And can I just say, Heather, I really, really appreciate your ability to discuss differences in opinion. It is not often, unfortunately even in public forums, to be able to discuss different points of view and still feel understood and be treated fairly. I think that is a very unique quality and I really appreciate it. Carin, Thank you for the nice words. I try really hard to consider all viewpoints. It is important that we be able to have good conversations where people feel safe sharing their ideas.